Lord Mayor of Belfast, Nichola Mallon, Bell's brother and sister plus a few fans dedicate a street in Belfast's Titanic Quarter named after John Bell's quantum entanglement theorem. I missed April Fools Day this year. It went right by me. But April's not yet over. So here's a few foolish links to brighten your day. 1. 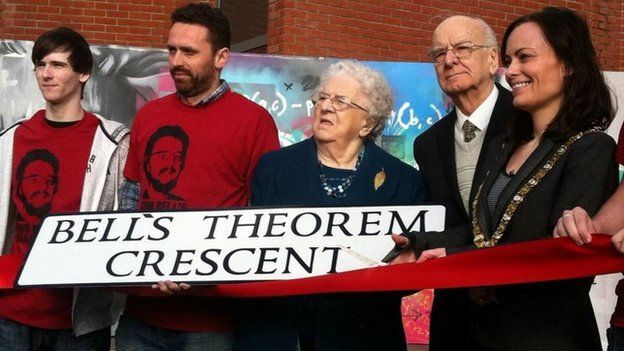 Belfast dedicates a street to Bell's theorem. On the fiftieth anniversary of Belfast-born John Stewart Bell's famous quantum-connectedness theorem, the city of Belfast, North Ireland, pulled out the stops to celebrate their favorite son -- the first city in the world, I would guess, to name a street after a theorem in mathematics. Now which theorem do you suppose will be the next to be so honored? I'm pushing to have the dirt road in front of my house renamed "No-cloning Theorem Way." 2. Nice film here on YouTube about the life of Grigori Perelman, the Moscow mathematician who proved the Poincare' Conjecture. No street named after this conjecture yet, so far as I can tell. The film is in Russian with English subtitles and features mainly interviews with Perelman's colleagues. The reclusive genius shuns both fame and fortune and appears mainly in blurry snapshots. 3. Nice article here on a fascinating site called Philosophy of Science Portal about Corning, the American company that invented Gorilla Glass, the superstrong, transparent substance on the front of every iPhone. Corning makes good stuff: I love my little Corning Visions-series all-glass sauce pan in which I cook my breakfast sausages. 4. Can NOTHING have a phase? This is a short pdf by Nick about whether the electromagnetic vacuum state, symbolized by |0> can possess a phase angle. And if so, how to effectively produce Gray Light, which is a coherent superposition of NOTHING (the vacuum state |0>) plus a single-photon Fock state |1>. Nothing to see here, ladies and gentlemen. Please move along. 5. From science impresario John Brockman's Edge.org site, Korean futurist Jaeweon Cho's Feces Standard Money proposes to give a job to every human being and to develop a new basis for money. 6. Podcast #469 from Lorenzo Hagerty's Psychedelic Salon features Terence McKenna speaking at Esalen Institute on "Philosophy With the Gloves Off". In this workshop Terence takes questions from his audience including an inquiry concerning the use of psychedelics as aphrodesiacs which Terence handles with remarkable grace and insight. A few years ago CCNY graduate Demetrios Kalamidas proposed a clever FTL signaling scheme that was refuted both in general and in its very specifics by an international team of quantum opticians. Details here, here and here. At the heart of the Kalamidas scheme is his original method of which-path info erasure that would seem to merit closer attention. 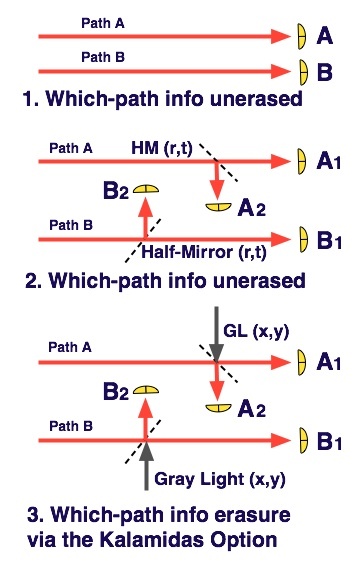 Before Kalamidas, the conventional method of erasing information about which of two paths a photon took was to confuse the observer by combining those two paths, either by directly bringing the two beams together with a positive lens or with a wedge-shaped mirror, mixing the two paths in a 4-port optical beam splitter, or overlapping the two diffraction patterns resulting from each path being sent through one of two closely-spaced double slits. The most beautiful feature of his new scheme is that Kalamidas is able to erase which-path info from two paths without actually having to combine the two paths. FIG A. 1. 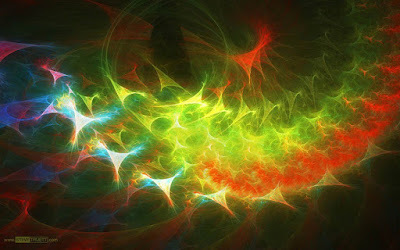 Path-entangled photon possessing full which-path info; 2. Erasing which-path info using diffraction at a double slit; 3. Erasing which-path info by combing paths in a beam splitter. FIG A1. 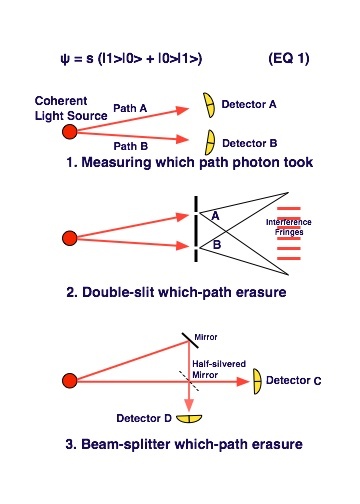 illustrates the case where which path the photon takes can be decided by merely placing one photon detector in each beam. Examples 2. and 3. show two ways that which-path info can be erased thru combining the two paths. In these two cases the photon can be coaxed into showing off its wave nature by "taking both paths at the same time" and "interfering with itself" with the result that large numbers of identical photons will produce a diffraction pattern or some other periodic behavior that is characteristic of waves of a certain wavelength. Which-path info erasure leads inevitably to the possibility of forming interference patterns, so a brand-new erasure method (such as that proposed by Kalamidas) can be expected to lead to a brand-new way of forming interference patterns. FIG B illustrates the development of the Kalamidas Option in three steps. Step 1 shows the path-entangled photon traveling unhindered along both paths. 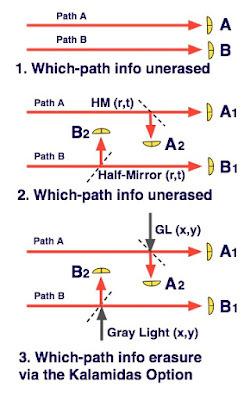 Detectors A and B unambiguously decide along which path the photon actually went and which path was untraveled. In Step 2, Kalamidas puts a 50/50 beam splitter into both path A and path B. Now there are four possible detection events corresponding to the four different detectors [A1 A2 | B1 B2]. I will use the symbol [10|00] to indicate the case where the photon triggers detector A1. And symbol [00|01] indicates that the photon has triggered detector B2. At this stage which-path info is still intact: it is always possible to infer from the detector response which path the photon took. And hence no wave phenomena will be observed. This use of Gray Light is due to Nick Herbert. In his original FTL proposal, Kalamidas used weak coherent light as his photon-number-uncertain source. The math is more complicated for Kalamidas's original scheme than for Gray Light. Even with the addition of Gray Light to the mix, photon which-path info is still largely preserved. There are two cases to consider: Either the photon is in the path (which I call FULL) or the photon is not in the path (which I call EMPTY). In the case where path A path is FULL, the addition of gray light leads to FIVE different outcomes , , ,  and . If path A is FULL, then path B must be EMPTY and the addition of Gray Light to an EMPTY path results in THREE different outcomes for path B, namely ,  and . The number of different outcomes for A FULL/B EMPTY is just FIVE x THREE = 15. Similarly the number of different outcomes for B FULL/A EMPTY is also 15. But four of these outcomes (the so-called "Kalamidas Outcomes") are identical so the addition of Gray Light leads to a total of only 26 different detector outcomes rather than 30. For most of these outcomes, which-path info is strictly preserved. For instance, outcomes of the form . and  can only occur in a FULL path. And outcome  can only occur in an EMPTY PATH. If only one photon is detected in each path, there is no way of knowing whether this was a Gray Light photon added to an EMPTY PATH or a FULL PATH unaltered by Gray Light. The rules of quantum mechanics say that if two processes can lead to the same output, then you must add the amplitudes of these two processes coherently. Coherent addition leads to interference effects. So Kalamidas's trick of adding number-uncertain light can lead to the interference of two beams of light without having to actually combine the two beams. To observe this interference we place a variable phase delay expQ in path B. The presence of the cosQ term is a sure sign of wave behavior: the two beams, though physically separate are interfering with each other in a periodic way. Only the four Kalamidas Outputs show this wavelike behavior; the other twenty-two outcomes (for whom which-path info is still intact) remain constant while the phase angle Q is varied, rather than oscillating like the KO terms. For incoherent superposition input, the Kalamidas outputs are constant. Note that the sum of the probabilities of each of these cases is 1/4, indicating that in a long experimental run, a Kalamidas output can be expected to occur 25% of the time. The fact that the Kalamidas Machine seems able to detect the difference between a coherent and an incoherent single photon two path superposition is the inspiration for a new faster-than-light signaling scheme I call KHAN (for Kalamidas-Herbert Augmented Nearness). 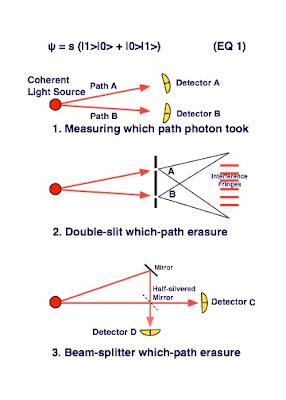 To achieve FTL signaling we need a source of TWO path entangled photons, one photon going to ALICE (along two paths C and D) and one going to BOB (along two paths A and B). 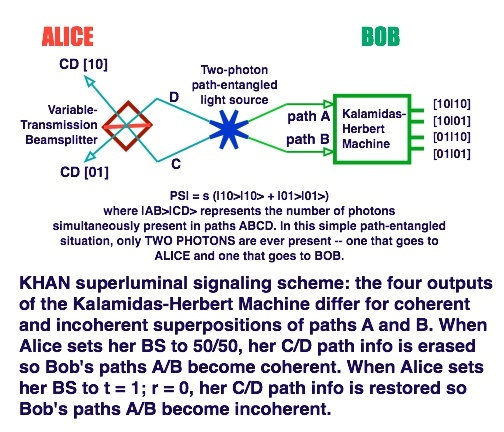 The entanglement is such that BOB's path A photon is always linked to ALICE's path C photon. 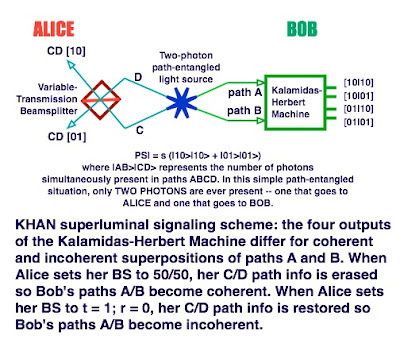 And BOB's path B photon is always linked to ALICE's path D photon. Each pulse of light produces TWO PHOTONS -- one which goes to ALICE and one which goes to BOB. But each of these photons can take two paths at once. Not so easy to explain in words. FIG C explains it better and even includes an equation. 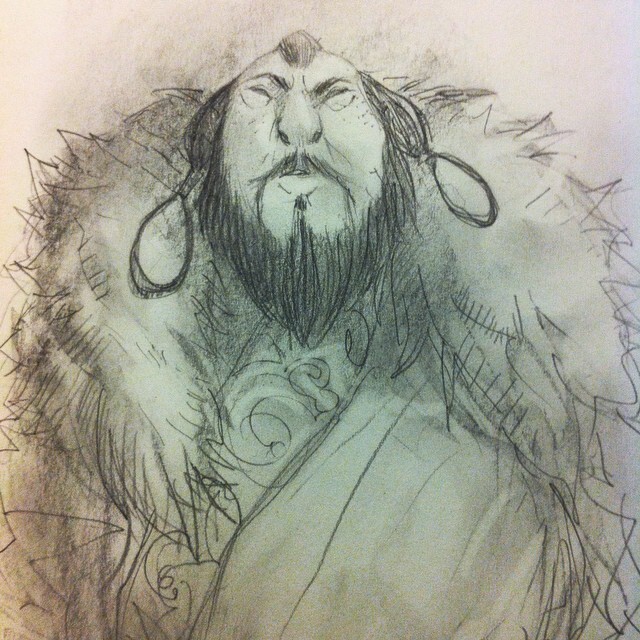 In the KHAN scheme ALICE is the sender and BOB the receiver. ALICE attempts to signal BOB by switching her photon from an INCOHERENT MIXTURE to a COHERENT MIXTURE of paths. Since the Kalamidas Machine responds differently to these two types of light, success would seem to be assured. ALICE possesses a beam splitter whose transparency she can change from 100% to 50/50 transmission/reflection. When ALICE chooses Option A (100% transmission) her detectors reveal which-path info (Alice's photon takes either path C or path D): Mutual entanglement forces BOB's photon to likewise take a definite path, so the Kalamidas Machine indicates INCOHERENT SUPERPOSITION (no wavelike behavior: no dependence on phase angle Q). On the other hand when ALICE chooses Option B (50/50 beam splitter) she erases all path information both at her site (and by mutual entanglement) at BOB's site as well. When ALICE chooses Option B, the input to the Kalamidas Machine is COHERENT PATH SUPERPOSITION, so BOB should observe wavelike behavior: periodic dependence on phase angle Q.
where S = √2 and s = 1/√2. For ALICE's beam splitter I have used the symmetric convention where both reflections are multiplied by i. When you do the calculation for the KHAN scheme, there is a sense in which both of these things happen -- 1. no waves at BOB's site for ALICE's Option A and 2. waves at BOB's site for ALICE's Option B. But in spite of this marvelous seemingly instant change at a distance from no-wave to yes-wave, this process cannot be used for superluminal signaling. INCOHERENT: When Alice chooses Option A and measures a photon in her path C, all four output of the Kalamidas Machine have the same constant probability: No wave behavior. Same when Alice measures a photon in path D.
COHERENT: When Alice chooses Option B and measures a photon in her path C, all four outputs of the Kalamidas Machine show wave behavior of the form [M + N sin Q] where M and N are constant. If we limit our observations only to the case where ALICE observes a photon in path C, then the Kalamidas Machine shows undeniable wave behavior at all four output ports. This looks good but the worst is still to come. When Alice measures a photon in her path D, all four outputs of the Kalamidas Machine now show wave behavior of the form [M - N sin Q]. Since both these ALICE outputs (C and D) happen at random with equal probability, the total probability of the Kalamidas Outputs is 2M. All wave effects vanish. We can see from this explicit calculation of the results of the KHAN scheme, that each INTERFERENCE EFFECT linked to ALICE's path C is exactly canceled by an equal and opposite ANTI-INTERFERENCE EFFECT linked to ALICE's path D. This kind of mutually canceling wave behavior is experienced over and over again by presumptive FTL signaling engineers. Wave behavior undoubtedly appears at BOB's site when ALICE erases her which-path information -- as can be verified by looking at all of BOB's outputs while triggering only on one of ALICE's outputs. But when both of ALICE'S outputs are taken into account -- as is the case in any FTL signaling scheme -- the waveness at BOB's site tied to one of Alice's outputs is EXACTLY CANCELED by the waveness tied to the other of Alice's outputs. I have dealt with this (seemingly inevitable) phenomenon in a previous post. So farewell to the KHAN scheme for superluminal signaling. Even though the effort failed, it was fun learning how to carry out the calculations using Kalamidas's clever new method of path erasure. Something imaginative and new like this almost never fails to excite me. Thanks, Demetrios.